This volume details the history of Australia’s oldest and most nationally iconic publishing firm, Angus & Robertson, and its long-term investment in establishing and maintaining a viable commercial arm in London from 1930 to 1970. Despite upheavals in ownership over the past three decades, the name Angus & Robertson remains to date the most recognised book-retailing brand in Australia. However, it is little known that through the incredible efforts of everyone involved in the operations of its London agency, Angus & Robertson was, for a time, also the most recognised Australian bookselling and book publishing brand in the commonwealth. This book documents a distinctive chapter in the history of Australian book publishing as it addresses how the company dealt with the tension between aspirational literary nationalism and the requirements of turning a profit while attempting to get inside the UK literary market. As well as detailing Angus & Robertson’s complete international relations, the book argues that the company’s international business was a much larger, more successful and complicated business than has been acknowledged by previous scholars. It questions the ways in which Angus & Robertson replicated, challenged or transformed the often highly criticised commercial practices of British publishers in order to develop an export trade for Australian books in the United Kingdom. 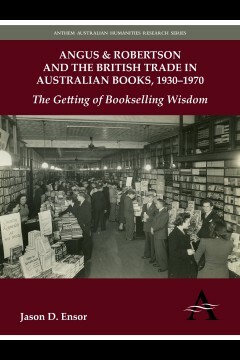 ‘Angus & Robertson and the British Trade in Australian Books, 1930–1970’ is the first of its kind; no other book in the present literary market records a substantial history of Australia’s largest publisher and its role in the development of Australia’s export book trade. Although a unique piece, this volume also complements existing studies on Angus & Robertson, Australian literature and Australian publishing. Jason D. Ensor holds a BA and MA in Australian studies and a PhD in communication studies from Murdoch University.